LEMP is a variation of the LAMP stack used for developing and deploying web applications. Traditionally, LAMP consists of Linux, Apache, MySQL, and PHP. Due to its modular nature, the components can easily be swapped out. With LEMP, Apache is replaced with the lightweight yet powerful Nginx. If you are wondering why it’s called LEMP, not LNMP, this is due to the pronunciation of Nginx (en-juhn-ecks). With a LEMP stack, you can expand, and scale in a very powerful fashion. I have been using LEMP stacks for quite some time now, however when setting up my servers, the configuration is made to be managed easily by one user. If this is the case for you, then this post will be an interesting read. With the following configuration given in this post, you will be able to point your domains to the server in mention, make a directory named /var/www/<your-domain>, and content will be directly served from that directory, without any fruther configuration. Simple as that. Before we begin, ensure that you are running the following the following commands as a regular, non-root user account on your server with sudo privileges. Digital Ocean has a good guide on how to get that setup if you are new to Linux. In the previous steps, you should have installed MySQL, and during the installation process it should prompt you to setup a root MySQL password. However, given that MySQL should be containing all important site data, much of which should be quite secure. By default, MySQL isn’t going to be very secure. Run the following command to properly setup MySQL, and ensure the configuration isn’t set to default. Note, this will ask you if you would like to re-setup the root MySQL password. If the password you setup during the installation is secure, you shouldn’t need to change it during this step. Due to Nginx being very lightweight, it doesn’t function with PHP by default, unlike other web servers. To get PHP (or php5-fpm in this case) to function with Nginx, we will need to configure Nginx to pass PHP based requests to the php5-fpm service. At this point, everything should be setup properly. To test, we can create a PHP test file, and if all goes well, you should see the information from your PHP installation. Once verified, make sure to remove this file, as it exposes configuration locations and information about the installation which can pose as an advantage to malicious users. 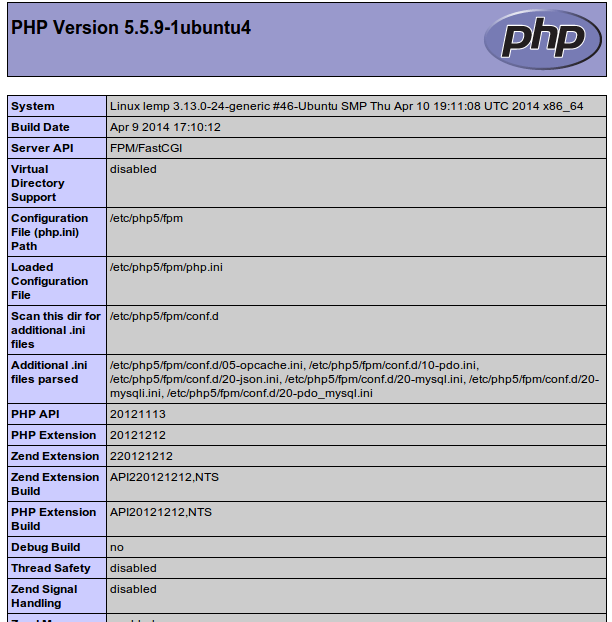 You should now have a LEMP stack installed on your Ubuntu 14.04 server. Happy hosting!